Charisma News - "Last May, Operation Mobilization Sweden asked staff newcomer Karen Daniels, from South Africa, to organize the mid-August initiative. The name “IGNITE! Sweden” was her inspiration, born of a desire to see this land on fire for God once again. After orientation and training at the base in Jönköping, 20 participants from 12 countries (including seven from OM Lifehope’s Transit Challenge 2011 Team) divided in two. One group traveled to Malmö in the extreme south, and one headed to Stockholm in the north." Should Churches Have Multiple Worship Service Styles? Consumerism or Contextualization? Ed Stetzer - "I'm often asked about whether churches should have multiple services. It's a big question because it addresses issues of preference, consumerism, and mission. I've been thinking about it and wanted to ask your help to ponder it further. This is another one of those areas where the pendulum seems to be swinging. When "praise choruses" were being introduced into corporate worship around the 1980s, churches that begin to use them were typically considered to have "blended worship," whereas churches that did not had "traditional worship." In Touch Ministries - "Despite Peter's vast fishing experience, he returned from a night's work with nothing to show for his efforts. It's quite possible that the Lord's request to let the nets down one more time struck him as unreasonable—after all, Peter and his partners were the professionals. Nevertheless, the fisherman complied, and his obedience blessed many. Scripture demonstrates that divine plans often defy human logic. For instance, who would design a battle strategy that involved only marching and shouting? God told Joshua to conquer Jericho that way, and doing so proved successful (Josh. 6:1-5)." "The infamous quote 'change is the only constant' certainly holds true at Mars Hill. We have experienced ongoing changes that have improved and transformed—as well as at times unintentionally created tension or heartache within our community. And now, we have another significant change to hold together.Feeling the call from God to pursue a growing number of strategic opportunities, our founding pastor Rob Bell has decided to leave Mars Hill in order to devote his full energy to sharing the message of God’s love with a broader audience." During this week the officers in the Eastern division in Norway have had their Officers meetings in Latvia. Ruth and myself have done the teaching and the visiting officers have made several visit at SA operations in Latvia: Riga second corps, The Social Centre in Riga, The children´s house in Sarkani and Skangali Manor. The faithful daily work continues in our different operations in Latvia and pictures are frequently sent in to us from the corps and institutions. Here is a picture from the soupkitchen in Iecava 40 minutes south of Riga. A normal weekly program at a Latvian corps can be soup kitchen, giving out food packages, giving out clothes, showers, laundry machines, Bible studies, Soldiers meetings, prayer meetings, worship services, Sunday school and youth meetings. From the personal sphere I just read in Dagen Nyheter that our relative, Mikael "Musse" Håkansson, just has become historic by becoming the person who have played most games ever in the top Swedish Hockey League. Mikael is grandson to Edith and Erik Håkanson, a great officers couple serving in Sweden for many years. Now it is Sunday morning and it is soon time to go down to the Sunday meeting at Riga first corps. Soon a new week will be here and then we will be travelling down to Daugavpils for two days Leader´s Council with all our leaders in Latvia. I hope it will be a blessed week for you. chron.com - "Early last year, pastor Rob Bell stirred up controversy with a book and a discussion that questioned the strong, historically held, Evangelical belief in hell. 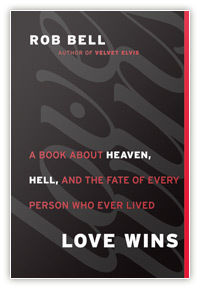 In Love Wins, the aforementioned book, he introduced Scriptural arguments questioning the traditional Christian doctrines of heaven and hell, God’s judgment and love. Siding with God’s limitless love, Bell put hell in question. While many criticized Bell for undermining Evangelicalism and Christian orthodoxy, no one critiqued him for undermining the American economy." Charisma News - "Did you ever think you’d see the day in America when the government would harass you for studying the Bible in your own home? That day has finally come, and it’s a danger to the home church movement that’s spreading across the US. A Southern California city is demanding that a small home Bible study group stop meeting unless they obtain a cost-prohibitive permit. 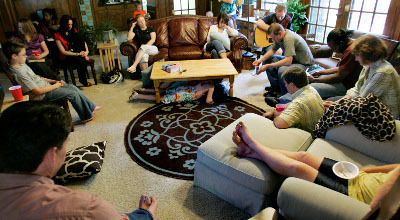 Homeowners Chuck and Stephanie Fromm were fined $300 for holding the Bible study." Christian Post - "Book Examines What Blocks Christians From Spiritual Growth. Barna’s recent book, Maximum Faith, concludes that without complete determination to live like Christ and for Him, the path to complete transformation and spiritual growth is blocked." "Questions matter. They can help you to grow deeper in your knowledge of the truth and your love for God—especially when you’re dealing with the harder doctrines of the Christian faith. But questions can also be used to obscure the truth. They can be used to lead away just as easily as they can be used to lead toward. Ask Eve.Enter Rob Bell​, a man who has spent much of the last seven years asking questions in his sometimes thought-provoking and often frustrating fashion. And when he’s done asking, no matter what answers he puts forward, it seems we’re only left with more questions." In Touch Ministries - "Some people reject the message of salvation because they are offended by the Bible's description of God's wrath. Even believers struggle to reconcile the Lord's love and justice. How can He at the same time be perfectly loving and perfectly just?" Wesleyan Life - "The rate of church attendance has been falling for decades in North America. The primary reason, I believe, is not that the music isn't contemporary or the preaching doesn't talk about real-life issues, but that there is not power in our worship. We seldom sense an authentic connection to God." Christian post - "Despite efforts to keep the 9/11 Memorial Service free of religion, invited speakers chose to read prayers and Scripture at the event. President Obama and former New York City Mayor Rudy Giuliani read from the Bible on the 10th anniversary of the Sept. 11 terrorist attacks in New York City Sunday morning. Former President Bush read a letter written by Abraham Lincoln that mentions God." 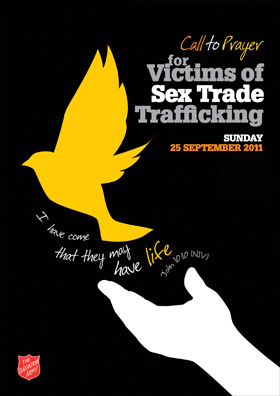 TSA International Web Site - "Salvationists and friends from more than 80 countries have already signed up to take part in the weekly Worldwide Prayer Meeting launched on 1 September by General Linda Bond." Ken Silva has written an interesting article about conterfeit christianity in our time. "One of these teaching a counterfeit Christianity, which more and more within the evangelical camp are now openly embracing, is Emergence Christianity pastor Rob Bell. You need to understand that Bell is absolutely HUGE within youth groups right now and is well on his way to becoming an idol among ”Christian Untouchables” such as Ravi Zacharias and Ray Comfort. Right now Bell’s every bit as much an icon with youth pastors and youth ministers as Elvis was to so many adults in this nation. Now lest you think this is simply an old issue I literally received a letter this morning from somone whose evangelical church has started using Bell’s materials; and at this point, let’s keep in mind his book Jesus Wants to Save Christians. And just what do you suppose Bell’s Jesus wants to save Christians from; well, as you can see in Rob Bell In A Nutshell: The Bible, stodgy old Sola Scriptura for one. " About Francis Chan´s new book "Erasing Hell"
"A frightening report from Israel’s Ambassador to the US Michael Oren raised the specter that the tottering Assad regime in Syria might lose control of its extensive stockpiles of chemical and biological weapons to Hezbollah terrorists. The Assad government is believed to have killed at least 3,000 of its own people and tortured and injured tens of thousands more in its desperate attempt to cling to power. The Syrian stockpiles are missile-ready—and Hezbollah already has highly accurate D-class Scud missiles capable of striking any city in Israel. They would simply need to put the two together—a matter of a couple hours of work, and they could launch an attack using deadly Sarin nerve gas, mustard gas, or one of the other illegal chemical weapons Assad is known to possess. As you read the news reports from the Middle East, keep in mind that in many cases, a brutal dictator is being overthrown but replaced by even more radical enemies of Israel." The Gospel Coalition - "A better parenting paradigm is faithfulness-driven rather than results-led. Our role as parents is not to “produce” children who exhibit certain behavior criteria, but to be mere instruments in the Holy Spirit’s ongoing work in the heart of our children." Charisma News - "We in the church have failed to remind this generation that while God is love, He also has the capacity to hate. He hates sin and He will judge it with the fierceness of His wrath." 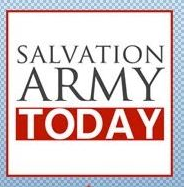 TSA international website - "Salvation Army teams in the Caribbean and along the east coast of the USA are providing assistance to people affected by Hurricane Irene."